- Colour in the rectangle containing the biggest number. - Look at the pairs of numbers and colour in the biggest one. - Put a tick underneath the domino with the most dots. - Put a tick underneath the shape with the most sides. - Tick the number that’s greater than the number in the circle. - Colour in the rectangle containing the smallest number. 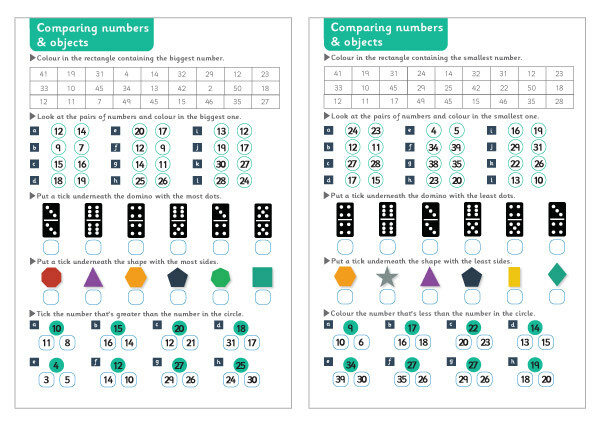 - Look at the pairs of numbers and colour in the smallest one. - Put a tick underneath the domino with the least dots. - Put a tick underneath the shape with the least sides. - Colour the number that’s less than the number in the circle. This resource contains 2 pages. This size sorting activity is based around images of domestic pets.